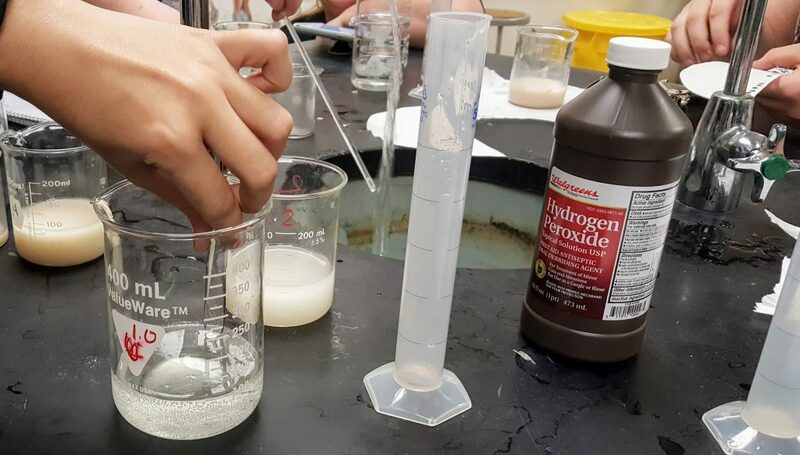 Students who complete the Enzyme Investigation lab can further explore enzymes with an inquiry lab on how concentrations of the substrate (hydrogen peroxide) and the enzyme ( catalase) can affect the rate of reaction. In the first experiment, students simply made a judgement about the amount of bubbling to indicate reaction speed, though this is a crude measure. As an extension, students can refine this technique using a floating disk procedure. Create a stock solution of yeast (approximately 2 grams in 100 ml of water) to show how you can dip a filter paper disk in the yeast solution and then drop it into hydrogen peroxide. The disk will briefly sink and then float to the surface. You can then time how long it takes to get to the surface as a measure of the reaction rate. Guiding Question: How does increasing the concentration of the substrate or the enzyme affect the reaction rate? Procedure: As an inquiry lab, students should design this themselves, though you should provide them a demonstration of how to do the floating disk technique. Depending on their chemistry background, you may also need to give them clues about how to create dilute solutions from the stock. Assignment: Students should create a CER chart to show the CLAIM (answer to the question) and EVIDENCE (data table) and REASONING to connect the data to the evidence and explain why they obtained their results. If you have a class that isn’t ready to do inquiry labs, then provide this step-by-step procedure handout which also includes data tables and guiding questions.